Way back in 1970, a young conductor named John Oliver pitched the Boston Symphony Orchestra administration on the idea that the BSO should have its own chorus. They went for it, and appointed Oliver as the chorus’s new director, at only 28 years old. 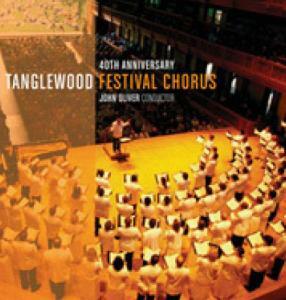 The Tanglewood Festival Chorus made its debut in April of that year in a performance of Beethoven’s Ninth under Leonard Bernstein. Forty years later, the TFC has over 250 local singers in its orbit, and as a volunteer ensemble has set a remarkably high standard of accomplishment. As recently as last month, the chorus gave a splendidly energetic and highly musical performance of Mendelssohn’s “Elijah’’ in Symphony Hall. Its commitment to singing from memory also affords it a rare level of in-the-moment responsiveness to the music at hand, and to whichever conductor is on the podium. In Symphony Hall performances the chorus naturally competes for the spotlight, but at Tanglewood in recent years, the TFC has commanded the stage of Ozawa Hall in largely a cappella programs under Oliver’s own direction. To honor the group’s 40th anniversary, BSO Classics, the orchestra’s in-house label, has released a disc of selections from those live performances, recorded between 1998 and 2005. The big piece here is a 20th-century choral landmark, Frank Martin’s beautifully tinted Mass for Double Chorus, but the disc also includes music by Antonio Lotti and Bruckner. The latter’s “Virga Jesse Floruit’’ occasions some robust and hearty singing. Mezzo-soprano Stephanie Blythe is the expansive soloist in Copland’s Genesis setting “In the Beginning.’’ But the highlight of the disc is the group’s wonderfully vibrant performance of Bach’s motet “Singet dem Herrn ein neues Lied.’’ Oliver conducts eloquently in this well-deserved recognition of the chorus’s anniversary year. The disc is being released concurrently with a live album of highlights from the memorable 2008 Festival of Contemporary Music at Tanglewood, devoted to the music of Elliott Carter. It’s great to finally have a dedicated Carter offering (digital download only) on the BSO’s label, though it’s hard to understand why there are only four works offered here (“Syringa,’’ “Reflexions,’’ “Mad Regales,’’ and “Sound Fields’’) — barely 40 minutes of music — from among the dozens of scores performed at the time. It’s also unfortunate that after all of the orchestra’s Carter advocacy, there are no BSO performances among these selections. The label should issue an independent BSO Carter disc to address this absence, and to allow the BSO’s local labors on behalf of this composer to reach a wider audience.